In today's kitchens, you will find that the counters and stoves are designed to form a level, continuous surface. This makes cooking and cleaning easier. However, stoves have two heights, a cooktop height and an overall height. When planning a new kitchen, it helps to know both before choosing your cabinets so you know how much room is available for cooking and cleaning. Stoves are made to be level with the countertop. 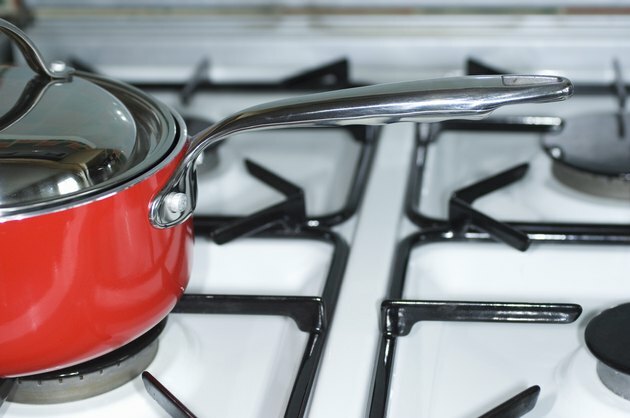 The height of the stove top is standardized at 36 inches. This is the same height as most countertops, so the cooking surface on your stove top matches the preparation surface on the counters. Since both surfaces are the same, it simplifies cooking and food preparation. With the stove and countertop both at the same height, it also makes the kitchen look professional and well-planned. While planning your kitchen, consider choosing counters with traditional heights that match stove heights for ease of use. Stoves have more than one height measurement to worry about. A backsplash and control panel resides behind the cooking burners, and this panel adds another several inches to the stove's overall height. Most control panels are between 8 and 10 inches high, but some are higher. The typical overall height for a stove with the back panel is 45 to 46 inches. The panel may well come in contact with any shelf or support bracket mounted on the wall behind the stove. Since a stove requires cooking room over the cooktop, additional height and space is necessary above a stove. Cabinets smaller than those installed above the regular counter surface are typically installed above the cooktop, allowing room for cooking activities. A 12-inch-high cabinet generally hangs above the stove. The top of this cabinet is usually 96 inches from the floor, which means that the bottom of the cabinet is 48 inches above the top of the stove. The higher the cabinet, the less space is available over the stove top. Bear this in mind when picking out your cabinets. In some kitchens, a vent or microwave is installed underneath the cabinet over a stove. This takes up an additional 8 to 12 inches of room for a vent alone, or up to 22 inches of space for a microwave and vent combination. The stove height does not change if a microwave is installed above it because the cooktop needs to remain flush with the countertop. However, before choosing an over-the-stove microwave, be aware of your cabinet height and the room it allows for cooking over the stove.